Long beans are also known as Yardlong beans. There are different names for these beans in different languages in India, like Karamani in Tamil, Chawalichya Shenga in Marathi, Alsandalu in Telugu, Bodi in Hindi and so on. Heat a non-stick pan, add oil and let it heat on low-medium flame. Add all the ingredients for tempering. When the seeds crackle, add chopped tomatoes and long beans. Saute for 2 minutes. Then add salt and water. Cover with a lid and let it cook for 8-10 minutes. Once cooked and water is fully dried, add grated coconut and mix well. Long beans vegetable is ready to be served. Serve it with chapatis, dal-rice, or even as a side dish. 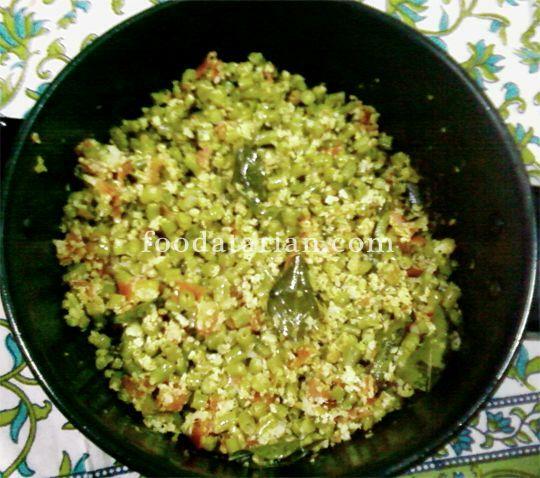 We can also prepare the same recipe with Cluster beans, French beans, Lady’s fingers, Snake gourd, Ivy gourd in this recipe. It comes out very well.